We recently took a whale watching excursion and Dockside Charters was amazing! We got to see a few different whales on our hour long trip and the captain was great. Even better was the guy working the back of the boat. I wished I had gotten his name (I do remember that he recently welcomed a baby girl), but our son got scared during the trip and he was helpful and reassuring. I can't wait to go back to Depoe Bay and will definitely be using Dockside Charters again! I was nervous about this whale watching tour only because it was a beautifully sunny day, reaching around 60 degrees and there was no shady spot to park our car and we had our dog with us. I asked the people at the desk if they could recommend a shady spot to park and they did but then they also said that we could bring our girl with us on the boat as long as she's people friendly. The crew kept us engaged, we had numerous whale sightings, and we got to see some harbor porpoises and some seal lions on the buoy! They were very accommodating with our dog and she didn't get sea sick! It was really the highlight of my whole trip and I can't wait to do it again someday! Thank you all so much! I highly recommend The Starship and Caption Kain. . We had an amazing day fishing and seeing the whales. Kain is very personable , it felt like we had know him for years. We will definitely be back. Amazing whale watching and awesome crew! We saw so many whales, and the crew made it feel like we were family. It was so easy going and so much fun. Definitely recommend these awesome people if you're looking for whale watching in the area! Great fishing today with Captain Turner on the Tacklebuster! This service is great to deal with. Friendly, nice, knowledgeable people making your reservations and the crew on The Tacklebuster was top notch. Not only was the boat nice, clean and well maintained but the crew was extremely helpful and accommodating. I absolutely love the Depoe Bay area and will always request and recommend fishing with the Tacklebuster! First time on the water here. Spend many weekends here and always say we need to do the whale watching trip. Dockside charter is one I highly recommend. From office to boat all were very helpful and nice. Great atmosphere. We saw our share of grey whales. Captain and mate were very helpful. The Sampson was roomy. Not overbooked and very comfortable. Even has a restroom on Board. Kids who are a little prone to motion sick took some Dramamine about an hour before the ride. Zero issues. The Bay is beautiful. Some times we don't realize how our work impacts others. This simple trip confirmed my daughters interest in marine biology. Will be back and highly recommend. This is a no miss and this charter is down to earth and good customer service. So don't put it off like we did. If you know my ratings I typically only rate when the service is amazing like this one or really bad. The five stars would have been ten if there was such a thing. We we're expected to share a pole!! It's not something other charter boats expect nor were we informed. They denied not informing us. This is the responsibility of the booking office. We booked 5 months in advance. We paid for an 8 hr trip ended up finding out upon arrival that it would be 6 hrs. Something that was changed months ago and they didn't inform us. The price was adjusted and we purchased two crab pots ended up receiving one for the price of two. Very disappointing. Individual price should be an individual pole and crab pot. nor would I want to share with any person of the 4 people that were puking on the boat for obvious reasons. I love to share but not when puke is involved. Lol We threw back 6 Black cod because the captain didn't recognize that they were not hake fish when asked by his deck hand!! It was finally pointed out by another like us in the boat. I have little to no fishing experience and could tell that they were distinctively different fish. Thankfully the deck hand was wonderful because the trip could have been horrible. This company is great! Jim who works in the front area of booking was friendly and knowledgeable and even let me borrow a coat so I wouldn't be cold. The crew of the Tackle Buster were friendly, fast, polite, and made this fishing trip a memorable experience for anyone looking to sport fish. From desk to dock these guys were consistently stellar in performance. I would absolutely book this company again! 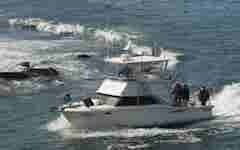 I have used Dockside Charters twice for whale watching. It is a great experience. Dockside had a great crew and makes the trip very enjoyable. You've got to be kidding! An hour long whale watching excursion for only $20??? The crew was friendly and knowledgeable, and we were able to spot about six different whales while we were out there. My wife was concerned she would get seasick and was dreading the whole adventure. However, she was calmed by the size of the boat , the Samson, was way bigger than the rubber raft she was imagining and she went from sitting and hanging on tightly for dear life to standing up at the bow of the boat taking pictures while bouncing over the waves! Unfortunately she lost her hat to Davy Jone's, but it was totally worth it. I was expecting a great time, and I certainly had one, but I was more impressed they were able to turn my wife's opinion around! This will make it easier to take her next time. Thanks Dockside!!! Our whole experience was GREAT! The staff was super friendly and our Captain spoiled us with finding 5 gray whales and took us on a tour of Bootleggers Bay...the ride back out of the bay was like a roller coaster. LOL Our whole family enjoyed ourselves. It was mine, and most of our groups first time deep sea fishing. We had a blast and caught lots of fish. Captain JT and guide Jake were excellent and made it very fun. I would definitely book with them again. This is so much fun and fun for the entire family. There was 9 of us with 4 children who had a blast!! Even the 9 month old enjoyed it!! Watching the whale come up in fro t of you and seeing the spout of water and tail flip through the air... so cool!! Captain Chris & Tiger are all stars. Hands down! They took exceptional care of our group, despite the slightly rough ocean conditions. They are kind, knowledgeable and went the extra mile to ensure we were all happy and our rods were working properly. I limited out on sea bass and scored a beautiful green lingcod too! Back on land, Dockside Charters cleans and vacuum seals your catch right there at the marina for a VERY fair price. What more could you ask for? Thank you so very much for the wonderful experience in Depoe Bay. I'll be back! Huge waste of money!!! Spent 250+ for 10 hrs of hell on a small cramped boat. Only enough rods for half the people, dimwits filled the boat. Captain chris is weird. Took longer then they said. Never going again!! Went on a whale-watching trip on the Tacklebuster. The boat departed and returned on time. We saw multiple gray whales fairly close. The 1.5-hour trip was a good amount of time. The price was definitely worth the adventure! We went on our first deep sea fishing charter and it was amazing we were on the smoken reel and our captain Daniel was the best. He made our trip so fun and we were able to catch our fish and I limited out on my crab pods. 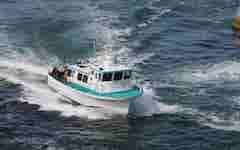 If you would like to go on a great fishing trip this is your company and ask for Daniel.